There’s a scene in Major League where the Indians win a game, and manager Lou Brown turns to his coach in the dugout and says, “Starting to come together Pepper, starting to come together.” Well, that scene could have played at any point for the Brewers by late June in 1982 – but especially between Friday, July 9, and Wednesday, July 18. The team followed a 20-7 June with an eight game winning streak over the aforementioned dates. The ragtag bunch known as Harvey’s Wallbangers wound up with a then-franchise best record on 95-67. One would think they pulled off a huge winning streak at some point. It seemed like they were always winning. But the eight game run in July turned out to be their longest winning streak. On the flipside, their longest losing streak was five games, and that happened in April when the team remained directionless under manager Buck Rodgers. The Brewers had an interesting schedule to start July, to say the least. They were just coming off a road trip that ended at Yankee Stadium on July 1, and had taken two of three games from New York. The next day they kicked off a stretch of thirteen out of fifteen games played at Milwaukee County Stadium. But what about the two away games? The Brewers played the Chicago White Sox in Comiskey Park on July 5, and the All Star Game happened a week later. Before the winning streak started, Milwaukee took two of three games from Boston. The wins were blowouts by scores of 14-5 and 7-0. They administered a straight up beat down on the White Sox in the one-off game, 10-4. After two losses to Minnesota, the Wallbangers were about to kick into high gear. Milwaukee pulled off a dominant shutout on Saturday night by a final score of 7-0. Robin Yount, Paul Molitor, and Ted Simmons hit homers to back Randy Lerch in his complete game effort. Simmons had four hits to lead the attack, and the three guys at the bottom of the lineup had three hits each – Don Money, Ed Romero, and Charlie Moore. The team had 19 hits overall. On Sunday afternoon, the Brew Crew broke out the brooms for the sweep with an 8-5 win. Molitor and Simmons again hit homers, and Moore and Gorman Thomas also went yard. Moose Haas started for Milwaukee and lasted nearly seven innings before Fingers had a multiple-inning save. 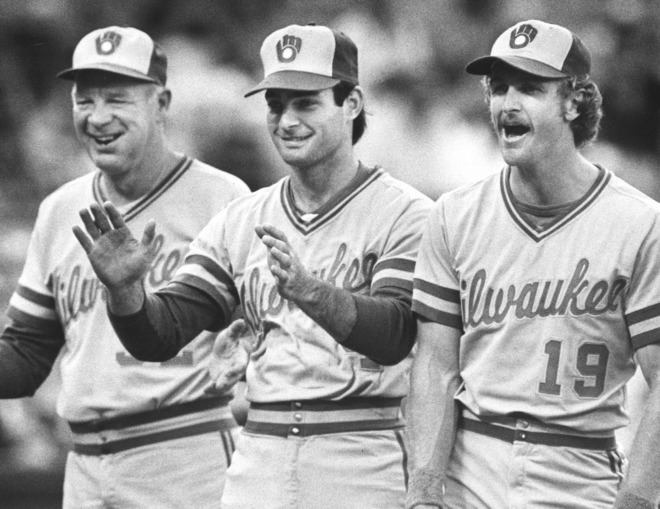 Milwaukee sent Cecil Cooper, Ben Oglivie, Rollie Fingers, and Robin Yount to the first All-Star Game played outside of the United States. The Montreal Expos hosted the game at Olympic Stadium. Cooper and Yount started the game and Cooper had a single in the first inning. Oglivie had just a single plate appearance and Fingers pitched a scoreless eighth inning. It was a losing effort for the American League by a score of 4-1, but the Brewers were back on the national stage, both for their appearances that night and the recent run in their division. How often do you see teams play a five game series these days? Don’t think about that too long. Not often, if ever. Back on July 15, 1982, Milwaukee kicked off a five game series against the Chicago White Sox. In fact, they came off the All-Star break with a doubleheader on Thursday night. The Sox were a worthy opponent and brought a 45-38 record into the weekend series, but would leave a lot closer to a .500 mark. Milwaukee took the doubleheader by scores of 8-4 and 5-4. The Crew only had one homer on the night – a solo homer by Ben Oglivie off Lamarr Hoyt in the nightcap. Caldwell won that game to improve to 7-8 on the season and Fingers collected save #19. Friday night rolled around and Milwaukee won again, this time 5-3. Don Money was the designated hitter that night and hit a solo home run in the fifth inning. Chicago took a temporary 3-2 lead the next inning, but the Brewers plated three runs in the bottom of the eighth. 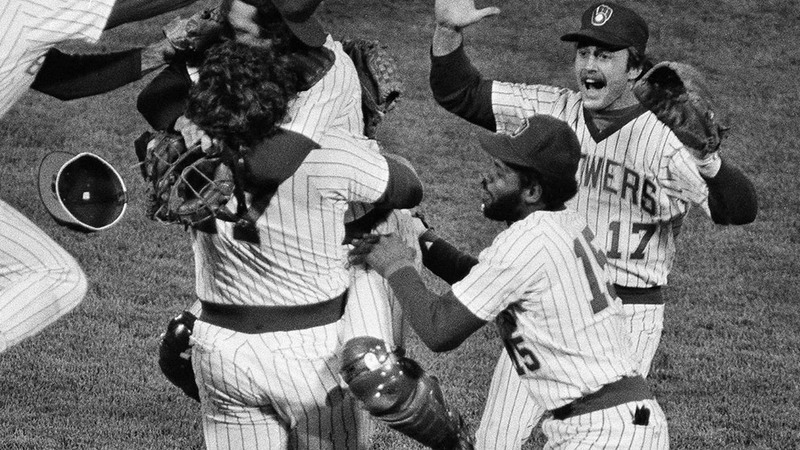 Molitor, Yount, Cooper, Simmons, and Thomas all had a hand in the exciting comeback. Haas and Fingers combined for the win and save. It proved again that every member of the team contributed to the win, which became the accepted norm in 1982. County Stadium was packed on Saturday night, and 52,959 fans witnessed a 5-2 Brewers win. It was another come from behind victory. Milwaukee scored two runs in the seventh and three runs in the eighth to make Pete Ladd victorious in relief of starter Bob McClure. Fingers notched his 21st save with a clean ninth inning. Chicago jumped out to a short-lived 2-0 lead on Randy Lerch in the second inning of Sunday’s game. The Brew Crew put up six runs in the bottom half of the second inning to put the game out of reach. The Crew batted around in the second inning, starting off with Thomas drawing a walk and Oglivie being hit by a pitch. Three consecutive singles followed, then a fielder’s choice, a sacrifice fly, a triple by Cooper and single from Simmons. Milwaukee went on to win 9-3 without the benefit of a home run. A little bit of everything happened that night, including right fielder Charlie Moore gunning down shortstop Bill Almon at home plate.